February started as January ended: very cold as well. Only in the last week of the month the temperatures rose to 7 – 10 ºC during daytime. 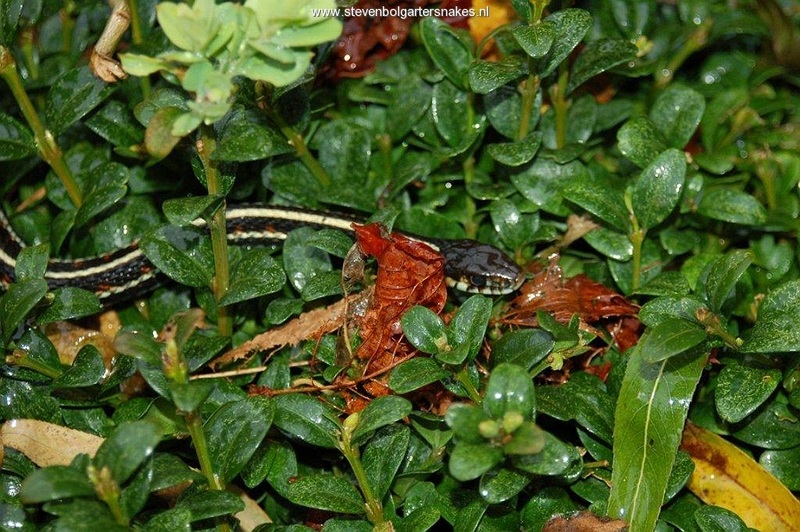 In the past years I saw males of the most cold resistant species (Thamnophis sirtalis) sometimes become a little active when temperatures all of a sudden rose above 5 – 7 ºC after a period of frost. The only dayI was home in the week with slightly higher temperatures around mid-day to check activity was Saturday February 27th. Around noonI saw one of my two males of Thamnophis sirtalis pickeringii sticking the anterior 1/3 of its body out of a low Buxus bush. It was cloudy and mild (appr. 7 ºC) without wind. No sun, although clouds were not too heavy. The snake could not sun itself and the brief period of activity was probably merely to check if winter was about to end. Later in the afternoon the snake had disappeared again. So far the first 2 months of the year the entire snake group has been in hibernation. The few hours the male was visible his body temperature must have remained below 10 ºC. I would not call that little sign of activity the end of hibernation.